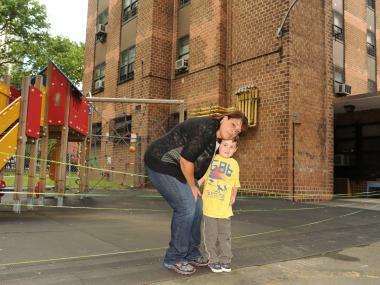 Sally Maldonado, the director of the nursery, is seen here with 4-year-old Alexander Krikler at the playground. YORKVILLE — An air-conditioning unit came crashing down last week from a 20th-floor apartment of a public housing complex into a playground where nursery school children were playing, the school's director and New York City Housing Authority officials said. Sally Maldonado, director of the Eisman Day Nursery on First Avenue near East 93rd Street, criticized the Housing Authority for lax safety enforcement regulating air-conditioning units at Holmes Towers after the frightening May 29 incident. Fortunately, the 4-year-olds on the playground had just been moved from the spot where the unit thundered down just two minutes before the accident occurred, so no one was hurt, Maldonado explained. "If the kids had not been moved, we would have had a tragedy on our hands," said Maldonado, a former resident and tenants-association president of Holmes Towers. "It was literally a near-miss." A NYCHA spokeswoman said housing authority staff immediately went to the apartment in question and said the resident was apparently replacing an old, non-functioning unit when it fell. The tenant might get kicked out as a result, she noted. "Staff informed the resident that according to NYCHA’s rules and regulations, the resident must inform NYCHA when installing an air conditioner and the unit needs to be properly installed," the spokeswoman said. "The resident was also made aware of the seriousness of not following these rules, including possible termination of tenancy." Still, Maldonado is not taking any chances. She's not letting her nursery school kids back into the playground abutting 1780 First Ave., near East 93rd Street, and is instead having teachers take the children to the nearby Asphalt Green for the rest of the summer. One parent even told Maldonado that her son awoke in the middle of the night screaming about something falling on him. She did an informal count of air conditioners at 1780 First Ave. and estimated that 85 percent of the residents do not have safety brackets under their units, she wrote in an email last week to NYCHA Chairman John Rhea. "If something would have happened to any of these students, how do you begin to explain to a parent that something happened to their child?" she wrote. "Understandably, the parents are really paranoid," Maldonado told DNAinfo New York. Years ago, she had requested an awning be put up above the playground and is now renewing her calls for the protective covering. "What is really striking is that when you look up at all the A/C units, there are countless that are clearly not bracketed properly," said Dianne Krikler, who sends her 4-year-old twins to the nursery school. "This is something that needs to be fixed fast," she added. "I think extra precautions should be taken where children are playing. They should be in everyone's apartment checking the air-condition units. They should be treating this like a serious issue." Maldonado enlisted help from City Councilman Dan Garodnick, who contacted Chairman Rhea on Wednesday about the incident. "I understand that NYCHA regulations require that residents install guards below their air conditioners, but this incident raises the question of whether these guards are in place and whether NYCHA is adequately enforcing its rules," Garodnick wrote in a letter. He also called for NYCHA to take "all necessary and appropriate steps to ensure that all air conditioners are properly and safely installed." Garodnick told DNAinfo: "This is an issue around the building that can affect little kids or adults. You don't roll the dice on safety issues like this." NYCHA officials said staffers were posting reminder notices in the building warning of the dangers of installing air conditioners properly. Under NYCHA rules, if a resident removes a window guard to install an air conditioner, they are supposed to call the development office and housing authority staff is supposed to inspect the window to ensure the unit is securely installed.